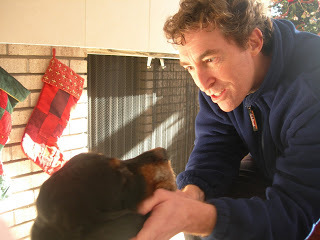 A very sad day indeed – I had to put down our beloved dog, Sigmund. He’s been quite frail for the last several months, so we’ve known that each day he’s felt good was a little gift. 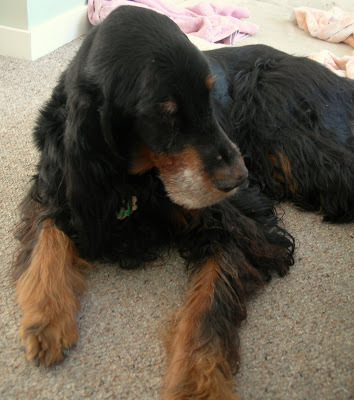 Not many Gordon setters get to be almost 15 years old. I returned from Shirley Taylor’s funeral yesterday morning – Sigs had stayed with our friend Marty while I was gone, since John is skiing in Colorado, not due back until tomorrow. Marty said that Sigs had had a rough night Thursday night, unable to stand for parts of the night. He was pretty perky yesterday morning when I picked him up, however, and seemed fine all day. Then all of a sudden last night he was completely unable to walk or stand. Nathan and I got him settled for the night, but this morning he was even worse, very disoriented and unable to eat or drink. I called the Golden Valley Emergency Vet and took him in early this afternoon. They were wonderful and so respectful. They gave me all the time I needed to talk to him and say goodbye. I held him while he passed away and I have to say, having never before witnessed a death, I was honored to be there with him and so grateful for how gentle and peaceful his passing was. Sigmund could not have been a kinder animal. He was as purely sweet as they come and we are sadly aware of the loss of such a gentle soul from our lives. Rest in peace, Roo. So sorry for you and your family. Poochies tend to work their ways deep into our hearts. I have heard so much about him, that I know he was a great guy. Now he's healthy, happy, and oh so frisky!! Thanks so much for your kind thoughts Donna, Suz, and Kelly. Sad days for awhile...damn dogs for being so lovable and sweet. Damn. I read your post last night with my aging boxer's chin on my knee, and was brought to tears. Thoughts are with you - and thank you for a delightful blog that satisfies with every serving! My dear friend, I'm so sorry for you, John, Nathan and A. Truly a loss, what a sweet guy he was. He was lucky to go the way he did, with you there beside him.